Spooky Tales Writing Competition – Closing Dec 3st! “What the Dickens? 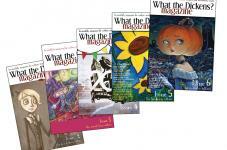 Magazine began back in 2011 producing digital and kindle editions of a fantastic magazine for the creative arts. We also printed one through the crowd-funding website Sponsume and made an eBook anthology of stories. Links to all of these can be found in the shop. After producing eight amazing issues, we wanted to get more people writing and engaging creatively as well as free up some time to start The Creative Life Project and so we moved it all online with the capability to allow people to contribute. It is a great opportunity for others to practise their writing and interview skills, meet people, discuss books and films, network and add something to their portfolio. Each article, review or interview written has an author box and readers can follow links to your websites and social media profiles helping you to become more widely known.